Nothing is better than the fresh, sweet flavor of home-grown fruit and berries. 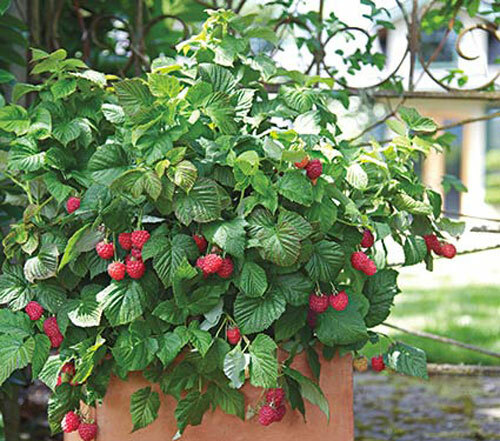 Even though not all fruit can grow well in the space of a garden planter, many do really well. When it comes to selecting the size of planter to use, we go back to the old saying, the bigger planter the better. You need room for the root system to be able to prevent the plant from becoming root bound. Eventually all fruit trees or berry bushes will need to be transplanted into the ground. 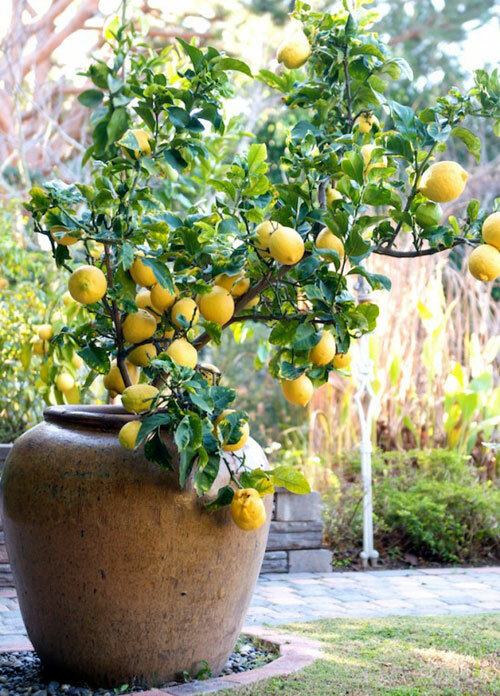 Many fruit trees are naturally small and perfect for a garden planter. Dwarf varieties are your best bet. Now is the time to select the container. You pretty much can go with any material of flowerpots. Clay, Ceramic, Concrete, Glazed, Lightweight Poly Resin or High Fired Clay will all work. Like we already said, make sure they are large enough and have drain holes. You do not want the plants roots to sit in standing water. Place the pots where they will be located before planting because of the weight. 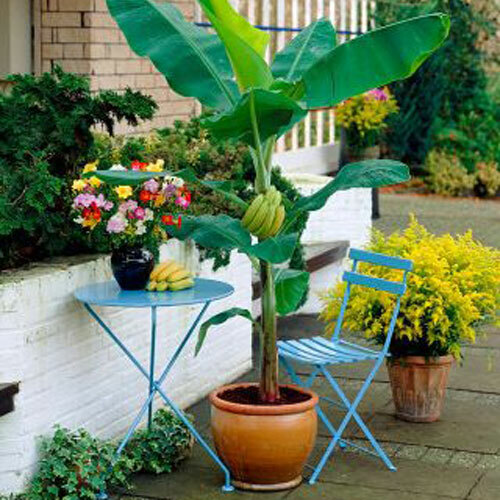 For the most successful crop, take care to give your potted plants sufficient water and fertilizer. Keep soil in the clay garden pots moist and never let it dry out completely. Apply a fertilizer as directed. With exceptions, most kinds of fruit and berries need at least 6 hrs of sunshine a day to set, ripen and sweeten the crop. Plant bare root blueberries, strawberries, dwarf citrus like apple, pear, lemon, peach & apricot. All work really well in garden containers, ceramic garden pottery and garden clay pots. With Thanksgiving right around the corner, we wanted to show you a few super easy tablescapes that we think are wonderful. Many use garden containers and others you will see you can use whatever you want. Glass jars, ceramic vases and even a stunning display using no container at all. Let�s start with this table arrangement shown above. 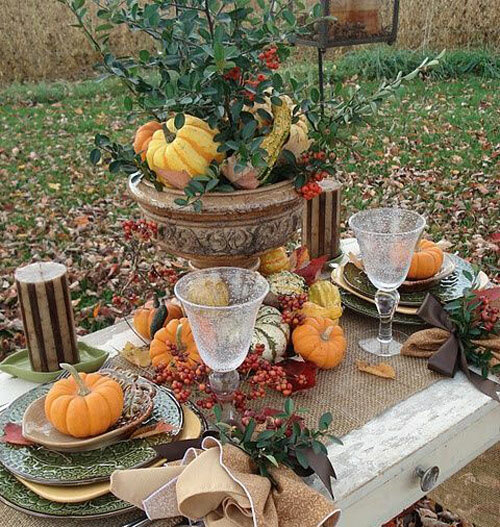 As you can see the center of the table is dominated with a large garden planter that is over flowing with colorful gourds. Fill in around the container with green plant materials that bring a realistic touch. The base of the garden urn is covered with more pumpkins and gourds and dried berries. This is a large and dramatic look. By using such bold bright colorful materials, you can stick with clear glass and simple place settings. Our next idea is a simple thank-full tree. Have each guest write on a paper leaf what they are thank full for this past year. Tie each leaf on to a branch of the thankful tree. To make the tree, collect garden branches and stack them into a lovely vase. Place the vase into the center of the dining room table. This creates an inter-active beautiful centerscape that is lovely. This idea is really neat because no garden container is used. 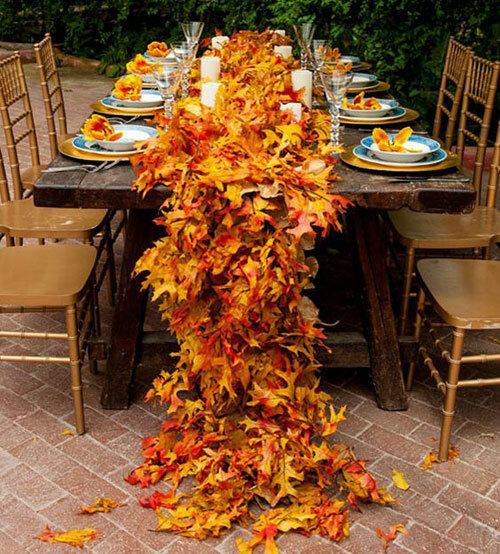 The center of the table is draped with silk fall leaf boughs. We love the way it drapes over the sides and lands on the ground. There are a few candles set among the leaves but that is all. It�s so simple and yet amazing that anybody can re-create this idea. Easy Peasy! 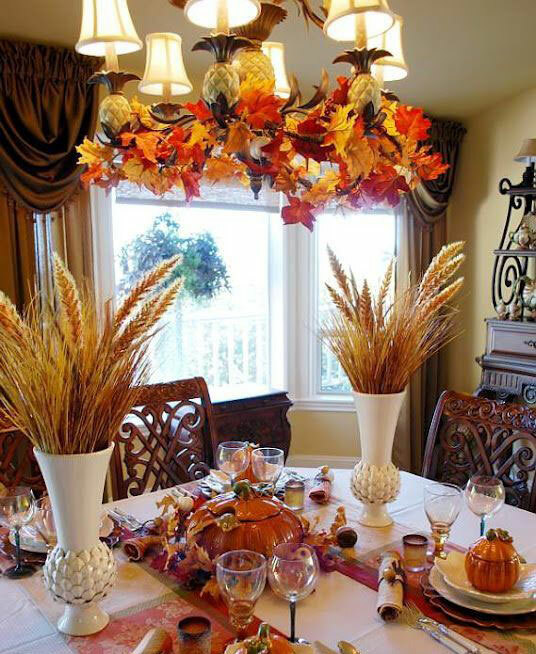 The final tablescape uses 2 white pineapple vases that are filled with straw. 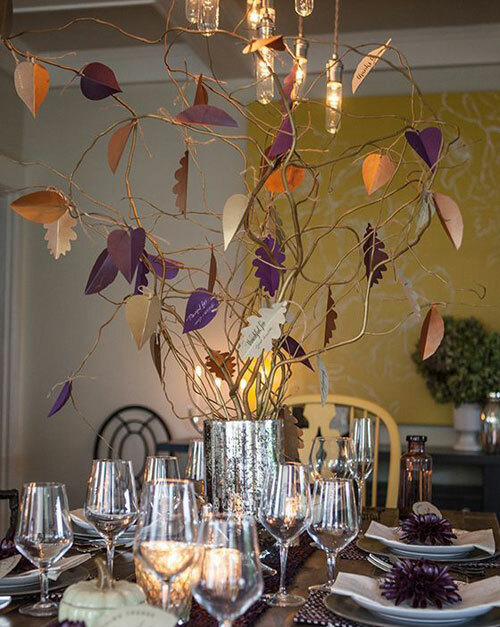 With the fall leaves draped over the chandelier the table doesn�t need any more color. The white vases add an elegance that is subtle and dramatic. Using your garden containers, vases & planters make creating a table that is memorable and beautiful is much easier than you think. Read More.....Seed saving from your garden. Read More.....Let's Repot a Succulent. 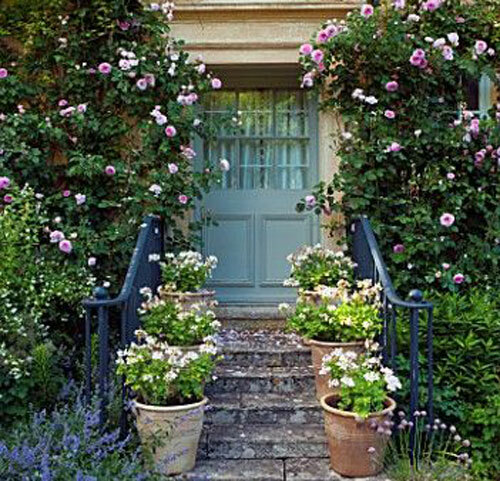 You may have just moved into a new home or you are considering redoing the outside décor at your current home. Here are a few tips when choosing a location for your garden planters & pottery. 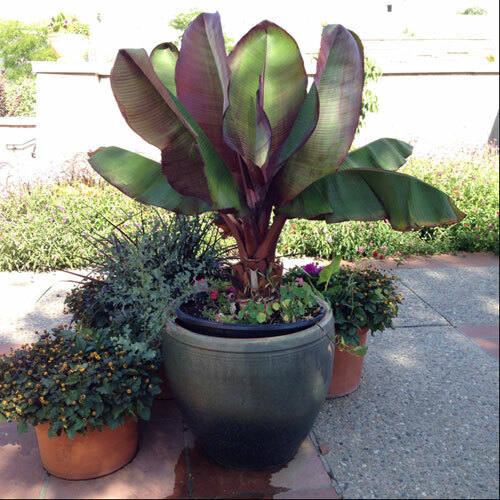 Plants have certain needs that should be considered when deciding where to place your ceramic garden pottery. Do they need full sun, shade, partial sun etc. That should take major consideration when deciding where the placement of the containers should go. 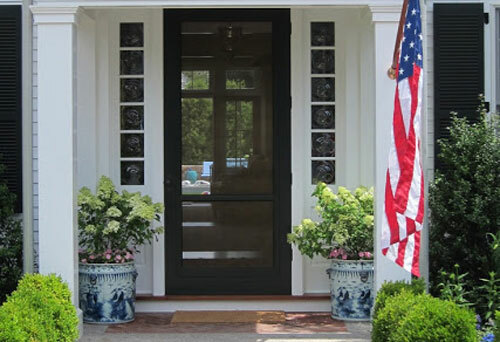 However, let�s say you want 2 planters flanking the front entryway and they are in shade. Then to have success you will need to consider the plant materials you put in them. Below are some general tips outside of the plant�s needs. 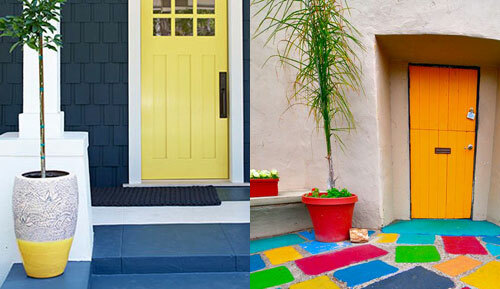 Start by considering the homes exterior color. 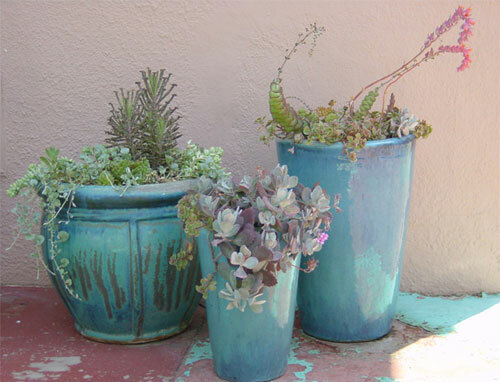 Select a garden pot that may have some of the same color tones to create cohesive feel. Is your home more natural architecture? Use clay flowerpots for their timeless look and earth tone colors. Is the home white and you want bursts of color? Then go with mixed groups of colorful planters. Mix primary colors like Red, Yellow & Blue and then plant them with a mixture of colorful flowers and plants. If the home is contemporary, you may be searing for a more stream lined look. Like concrete cubes or sandstone rectangles. Available in muted colors these will blend in with the architecture and not draw the eye away from the homes lines. Stick with one color of flowers, all white, pink, blue. Create a serene almost Zen quality that will compliment not fill it up. A window box planter overflowing with trailing ivy is perfect for a more traditional home. If the home is made of brick, then use colorful flowers to compliment to the mono-toned brick. Place rectangle planters along the walkway and add evergreens so that they will look perfect thru all seasons. There are unlimited styles of garden pottery and planters that you can choose for your home. And, there are unlimited types of plant materials that will work with them. Just take your time, have fun and finally create the look you have always wanted. Read More.....Let's Pot a Evergreen Tree! Here in Arizona we have a lot of Aloe Vera plants growing naturally. 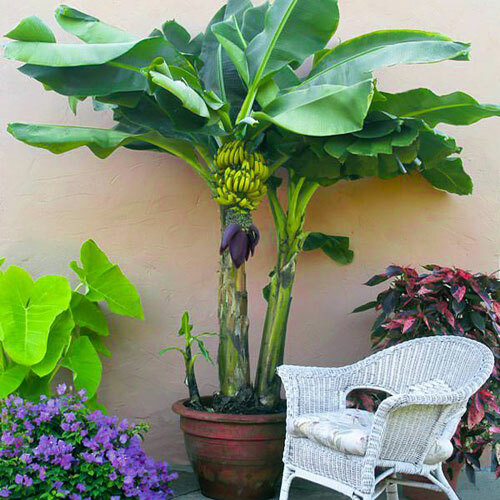 Seeing these wonderful plants potted and placed on a patio as part of your landscape décor is easy to do. 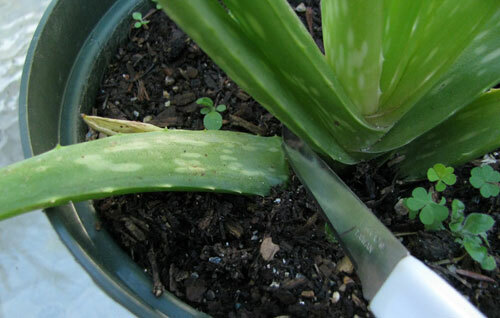 Growing them in a pot is easy but starting from an aloe leaf is rather tricky. Most people will start with an offshoot which tends to be easier to do. Starting with a leaf is rather difficult because these plants have a lot of moisture and will dry out before they can take root. But, using an offset is easier. 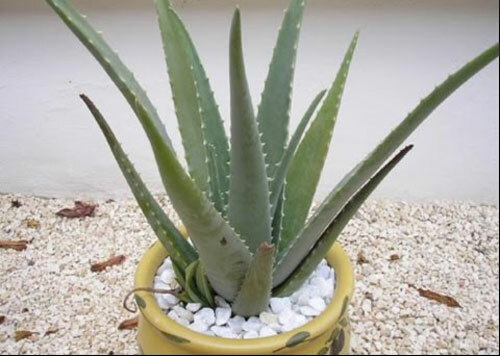 Find an aloe leaf that is a bit over 3� long. 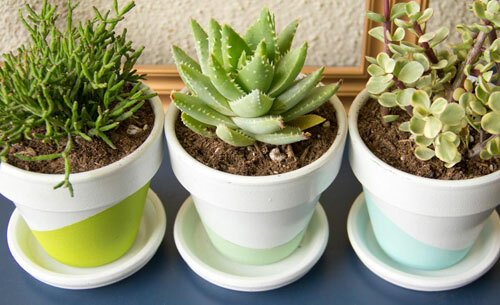 Maybe you have a potted aloe already in your yard or on your patio. Cut the leaf at the base using a sharp, clean knife. Try cutting in a downward angle. Place the leaf in a warm place for a film to form over the cut. Anywhere from a few days to weeks. Now select the pot you want to use. Make sure that it has a drain hole. 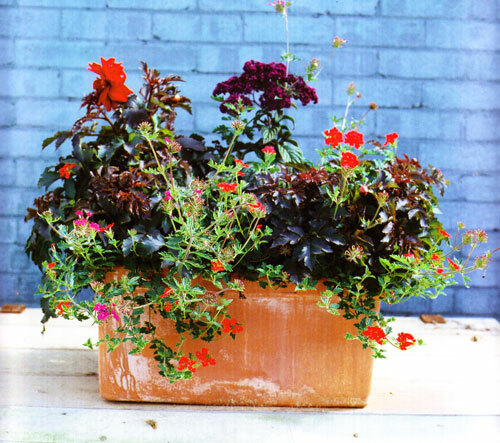 Most pots will work fine but we recommend you start with a terracotta clay flowerpot. 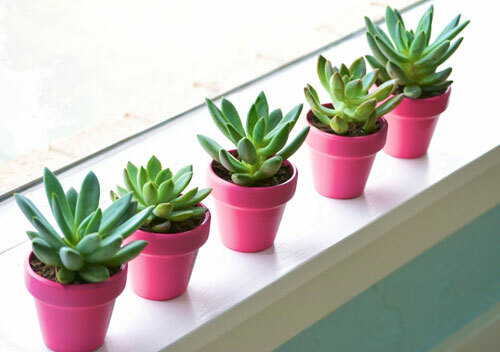 Terracotta clay is meant to breathe and will start your plant out with the healthiest chance. Fill the garden planter with cactus soil and dampen it. Stick the leaf cut side down into the soil burying it by 1/3. Place the clay garden pot some place warm and sunny and water it with care. For 4 weeks keep the soil moist. Then wait till soil is completely dry before you water it again. Don�t worry if the leaf shrinks and dries while it is developing roots. Another way is to start with an off shoot. Smaller than the main plant and has 4 leaves several inches tall. Follow the directions above for planting. Make sure the roots are completely covered in soil. Water enough to make soil damp but not soaking. Place the pot in a sunny spot and wait one week before you water it again. Now decide which method is better for you. 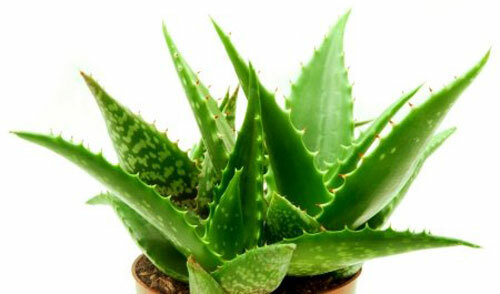 But, know that unless you pot these aloe plants they will take over your garden. 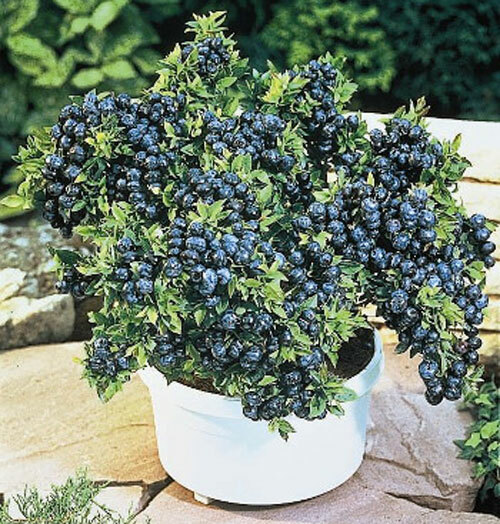 By keeping them contained in a garden pot � you will be able to decide where you want them to grow. Good Luck! Now that Fall is here, people are thinking about family get together, holiday visitors, cooking & gift giving. Thinking about your garden planters and next Spring is not even a vague notion. But, as you will read, now is the time to be thinking about planting up your garden bulbs. It only takes a bit of planning to assure that next Spring when you least expect it colorful flowers will start shooting up from your garden planters. So, what is the first step? How about deciding what flowerpots you want to plant the bulbs in. Clean out a summer planter or how about purchasing that one pot you have had your eyes on for some time now! 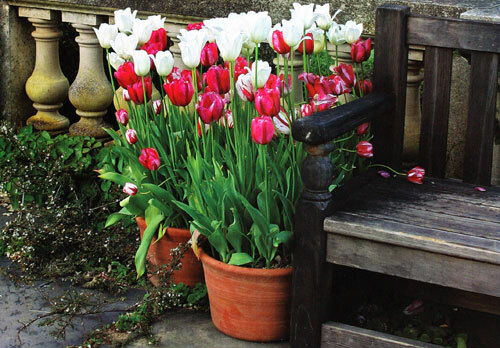 Either way, make sure that the pots you select are deep enough to bury the bulbs into, making sure they are completely covered with potting soil. Azalea pots are shorter than a standard flowerpot but they work well. A drain hole is also important. That way the bulbs don�t sit in standing water and possibly rot. 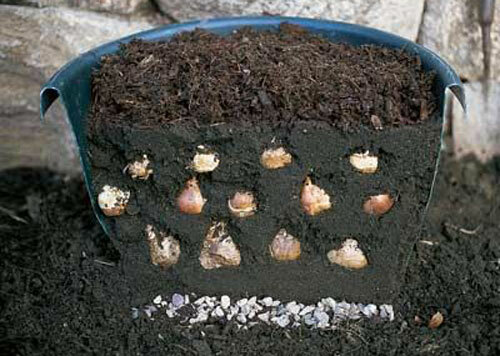 Planting fall bulbs in containers is similar than planting them directly into the soil. 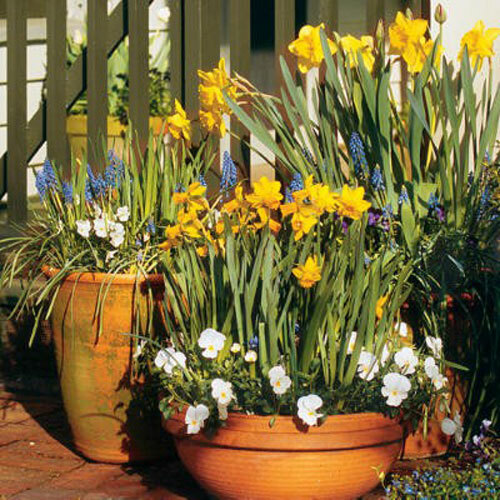 What�s great is that you can really pack a bunch of bulbs together creating a colorful potted display when bloomed. 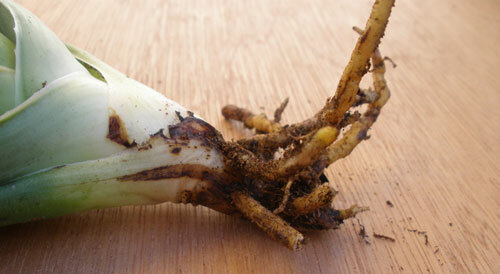 Try to plant the bulbs 6� deep with the pointy end facing up and the roots down. Group them together for a huge display or space them for a sparse display. Try to keep the bulb count odd not even. Cover the top of the clay garden pot with mulch to protect the bulbs while they over winter. You can use leaves, peat moss, pine needles or a mulch product from your local garden center. That�s it. Not all that difficult. So, if you plan NOW think about what you will have next Spring!